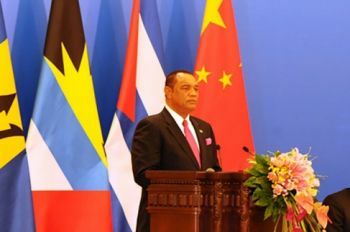 A proposal to acquire funds from China’s $3 billion dollar investment fund will be made on behalf of the Bahamas is among initiatives that the Bahamas will pursue in coming weeks. Prime Minister, the Rt. Hon. Perry G. Christie made the announcement during his remarks at the first ministerial meeting of the CELAC-CHINA (Community of Latin American and Caribbean States) Forum in Beijing China on Thursday, January 8. Mr. Christie is representing CARICOM countries. In addition, Mr. Christie said that the Bahamian government will also be promoting opportunities for investment in the energy sector, gas exploration, mining, forestry, tourism, airline services, financial services, agriculture and fisheries. He explained that given that energy, water, sanitation, coastal protection, and protection of critical coastal infrastructure are central to the capacity of CARICOM countries, all efforts must be considered to mitigate the effects of climate change. He stated the desire of CARICOM countries to see greater participation of emerging market economies based on ‘legitimacy, fair representation, responsiveness and flexibility.’ Currently, the criterion for allowing or denying access to concessional financial is based on GDP per capita income. Mr. Christie said that CARICOM is pushing to eliminate this practice, as it does not adequately reflect the disparities and differences in development with the various islands. Finally, he voiced the Caribbean Community’s wish to deepen and strengthen the relationship with China. The Bahamas will host the Intercessional Meeting of the Heads of Government of CARICOM on 26th and 27th February. During that time, Mr. Christie said that major focus would be on the development of human capital. He said that the future of CARICOM countries would be ‘greatly enhanced’ by increased investment in young people in the domains of education, culture and sports. The CELAC-China Forum was established with the objective of promoting political, economic, trade, people-to-people, social and foreign co-operation” between China and the Caribbean and Latin American countries. It is made possible in part by the $20 billion US-dollar fund, which the Chinese government has set aside for infrastructural development through concessional lending, as well as through the diplomatic channels that have been fostered and nurtured in recent years. According to the International Monetary Fund, China is now the largest economy in the world, based on purchasing power parity. China also has the largest foreign reserves in the world. Mr. Christie said these statistics only confirm what The Bahamas and the sub-region had already known: that China is a significant source of investment capital and has established itself as a worthy economic partner. In other news from China, Prime Minister Christie met with the Premier of the State Council of the People’s Republic of China, Li Keqiang, on Thursday afternoon following his inaugural address to China/CELAC delegates. It was during the meeting with the Premier that the nation’s chief raised the issue of the execution of local infrastructural projects. He also introduced talks of another national gift to the Bahamian people in the form of a multipurpose indoor stadium to facilitate youth and cultural development in The Bahamas. In the end both sides agreed that The Bahamas would draft a paper for the proposed indoor stadium for review.